More than 100 people attended the meeting – including 50 scientists. The others were from 18 different companies and organisations. The majority of the world’s population live in cities, which demands new, smart solutions. The discussions were wide-ranging at the AIMday Sustainable Cities meeting held 23 October at Uppsala University. The topics covered everything from technical solutions to promoting health and integration. More than 100 people attended the meeting – including 50 scientists. The others were from 18 different companies and organisations, including NCC and the Municipality of Uppsala, which which Uppsala University has a collaboration agreement. “This was our first AIMday on sustainable cities. 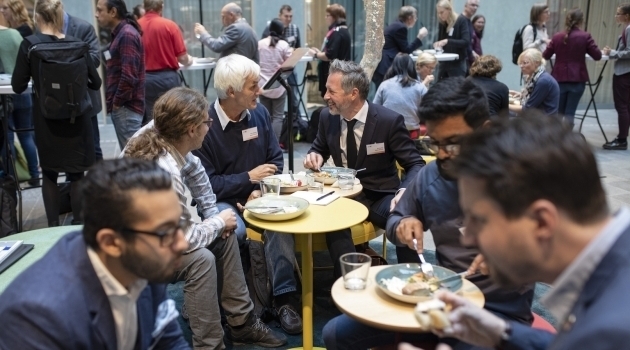 There is tremendous knowledge in the fields of engineering and technology at Uppsala University, but also extensive research on the social aspects in the humanities and social sciences. Demand was high and we received 60 or 65 questions before the meeting,” says Harris Stamatopoulos, a collaboration manager at UU Innovation. Developed at Uppsala University in 2008, the AIMday meeting approach has spread in the university world in Sweden and abroad. The process is that companies and organisations submit their questions in advance, which are then matched to suitable scientists. Over the course of the day, attendees are brought together in small groups organised around various issues. The questions at this meeting dealt with everything from how to use sensors in urban environments and recycle construction materials to building meeting places where everyone feels welcome. “This is an interdisciplinary programme of meetings between external actors and researchers from all fields of science and scholarship,” says Harris Stamatopoulos. He thinks gathering them around urban sustainability makes sense. It is an area where research can truly benefit society and where companies are looking for expertise and scientists to collaborate with. The aim of the day, as with all AIMdays, is to initiate new collaborations. Harris Stamatopoulos and his colleagues at UU Innovation will be measuring the results of the meeting, and can also help fund studies. Technical sustainability, covering topics such as materials, energy, digitalisation, building and infrastructure. Social sustainability, addressing matters including integration, gender equality, security, health and occupational health and safety. Sustainable systems, including climate change, sustainable business models, recycling and urban planning. Interdisciplinary projects that cross the lines between the first three themes.